Keywords: wound management; hard-to-heal leg, foot and pressure ulcer; postoperative wounds; topical negative pressure; negative pressure wound therapy; primary care; treatment costs. Negative Pressure Wound Therapy (NPWT) also known as Topical Negative Pressure (TNP) was used for wound management in primary care. We studied time for ulcer healing, change of ulcer size and formation of granulation tissue. The study group consisted of 12 patients, treated at Blekinge Wound Healing Center, and chosen consecutively for NPWT/TNP treatment. Eight patients had hard-to-heal ulcers with signs of delayed healing. Three patients had complicated postoperative wounds and one patient had a hydrostatic traumatic ulcer. The study group was representative for primary care patients with population heterogeneity, difference in age, risk factors, ulcer etiology as well as treatment designs before NPWT/TNP treatment. We used the pumps available in Swedish primary care at the time of the study (2006-2008) i.e. V.A.C. and V1STA. We found that 6/12 patients healed entirely after treatment with NPWT/TNP with a mean healing time of 11 weeks (median 9 weeks). We also found that the mean ulcer size of 15.1 cm² was reduced to 13.5 cm² after treatment and that there was formation of granulation tissue in all cases within 3 weeks. Calculating the costs was not a primary aim, but we found it important to note the costs for using NPWT/TNP in primary care, which amounted to mean weekly costs of €339 for V.A.C. and €279 for V1STA including dressing material. Although our study material is small, we found NPWT/TNP to be a manageable alternative for patients with hard-to-heal ulcers or postoperative wounds in primary care when used during a short period of time for formation of granulation tissue. Negative Pressure Wound Therapy (NPWT) also known as treatment with Topical Negative Pressure (TNP) is a vacuum assisted method for ulcer care using a negative pressure of 60-125 mm Hg on the wound bed. The method has been in use since 1995 as one method for treating surgical wounds, acute wounds and more scarcely for hard-to-heal ulcers. Treatment with NPWT/TNP is used within high-technological departments, such as departments of cardiothoracic surgery, where the method has been extensively evaluated for mediastinitis after heart surgery. Patients' experiences of treatment with NPWT/TNP for mediastinitis have been described in one Swedish doctoral thesis. The devices are non invasive systems, where one unit delivers negative pressure onto the wound bed through a drainage tube, which decompresses a sponge of polyurethane alternatively gauze in a continuous or intermittent manner. The wound fluid drains to a canister. The patient carries the unit in a small shoulder bag. Dressings are usually changed three times a week. Most international studies are based on the V.A.C. therapy, which was introduced on the American market in 1995 and in Europe in 1997. In the USA, the method has been used for treatment of patients with hard-to-heal ulcers within home healthcare but studies from Swedish primary care are still lacking. The aim of this study was to examine if negative pressure would be a clinical manageable alternative for wound management in primary care, when considering time to ulcer healing (measured in weeks), change of ulcer size (measured in cm² using a digital planimeter) and formation of granulation tissue (assessed by visual inspection). Although calculating the costs was not a primary aim, we thought it was important to report the costs for using NPWT/TNP in primary care. 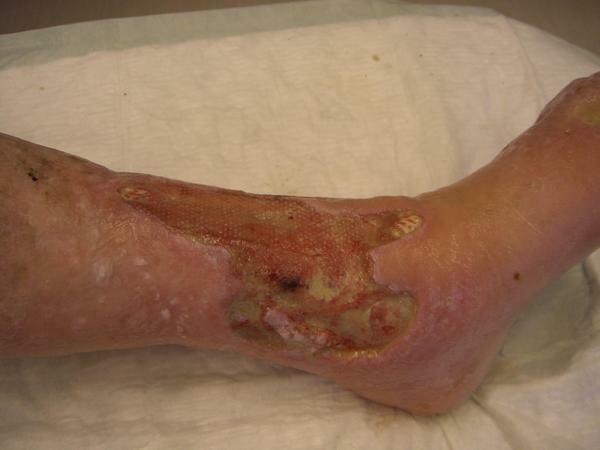 The patients/cases in this study (n=12) were treated at Blekinge Wound Healing Center during 2006-2008, a leg ulcer center for patients with hard-to-heal ulcers. The center is based in primary care and covers the whole county of Blekinge (150 000 inhabitants). Experiences from wound management at the center have resulted in the creation of a national quality register for hard-to-heal ulcers, RUT (Register Ulcer Treatment) where diagnosis, treatment plan and follow up until ulcer healing or adverse effect are registered. During 2006 and 2007 we used V.A.C. which was the only unit on the Swedish market at that time and in 2008 we had access to both V.A.C. and V1STA. We chose twelve patients consecutively as soon as the pump was accessible. The study period was between August 14th 2006 and December 15th 2008. Eight patients had hard-to-heal ulcers with signs of delayed healing, which is noted when the ulcer size does not decrease within three or four weeks in spite of correct diagnosis, accurate topical treatment and adequate compression therapy. A hard-to-heal ulcer is defined as an ulcer, which has not healed properly within six weeks. Four patients had complicated postoperative wounds/traumatic ulcer. From the author's experience, as a general practitioner with twenty years of special interest in leg ulcer care, the study patients were representative of primary care with population heterogeneity, age profile, risk factors, ulcer etiology as well as treatment regimens before NPWT/TNP treatment. All study patients had been treated with conventional therapy, i.e. compression with 2-, 3- or 4- layer bandages depending on the Ankle Brachial Pressure Index (ABPI), intermittent pneumatic compression (IPC) when appropriate and dressings such as hydrocolloids, polyurethane dressings, topical antimicrobials (such as cadexomer iodine and silver) or larvae therapy and pinch grafting. Mean treatment time with conventional treatment before NPWT/TNP was 80 weeks (median 26 weeks). Bacterial cultures were only taken when there were signs of local ulcer infection. This was the case for two patients, who were treated with antibiotics for 10 days in accordance with swab results (Table 1, case 1,2). Another four patients had ongoing antibiotic treatment when treated at the Department of Infectious Diseases and the Orthopedic Department as well as in primary care (Table 1, cases 3,4,10,11). Table 1. Patients (n=12) with hard-to-heal ulcers or complicated postoperative wounds/traumatic ulcer treated with negative pressure at Blekinge Wound Healing Center: patient's age, diagnosis, ulcer duration, ulcer size, treatment time with negative pressure, time to wound healing. One way to evaluate the effectiveness of a treatment is to measure ulcer size. We used a digital planimeter, which has been shown to be a reliable method. It has also been demonstrated that if a selected treatment is effective, there should be a decrease with 20% - 40% of the ulcer size within 2-4 weeks. Before treatment with NPWT/TNP, three patients had had surgical revision at hospital (Table 1, cases 3,4,11) which did not result in a reduction of ulcer size. Formation of granulation tissue was assessed by visual inspection at dressing changes. We treated 12 patients (5 women and 7 men) with a mean age of 57 years (range 32-81 years) (Table 1). 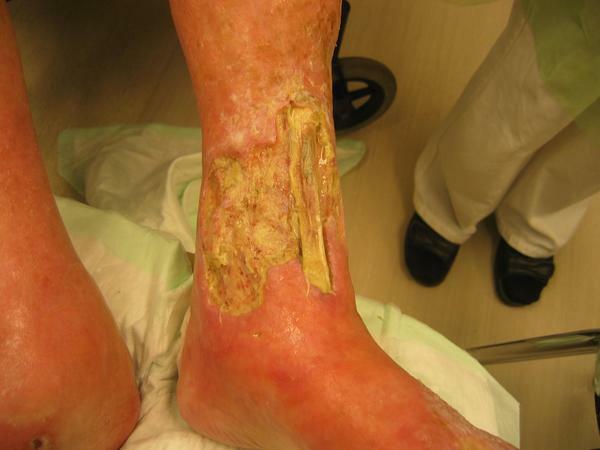 Eight patients had hard-to-heal ulcers where the etiologies included two venous ulcers, three neuropathic foot ulcers in patients with diabetes mellitus, two pressure ulcers, and one venous - arterial ulcer. Three patients had postoperative wounds and one patient had a hydrostatic traumatic ulcer. The mean treatment time with NPWT/TNP was 7.3 weeks (median 3 weeks). Treatment times for nine patients were between one and eight weeks, and for the remaining three patients were 16, 20 and 27 weeks respectively. Complete ulcer healing was assessed by visual inspection. 6/12 patients were healed entirely with a mean healing time of 11 weeks (median 9 weeks), (Table 1, cases 2,3,5,6,8,12). The patient with a hydrostatic traumatic ulcer healed within 8 weeks (Table 1, case 12). Two patients with postoperative wounds healed within 7 weeks (5 and 7 weeks respectively) while the third patient, with co-morbidities (such as diabetes mellitus and rheumatoid arthritis) was not healed at follow up (Table 1, case 11). Mean ulcer size was reduced from 15.1 cm² (median 6.6 cm²) [range 0.3-76.8 cm²] before treatment to a mean of 13.5 cm² (median 3.0 cm²) after treatment. For one patient (Table 1, case 1) with venous ulcer the ulcer size increased during five weeks' treatment from 69.4 cm² to 72.6 cm². In this case, treatment with NPWT/TNP contributed to the formation of granulation tissue. Also for the patient with a recurrence of pressure ulcer (Table 1, case 2), ulcer size increased from 3.5 cm² to 4.7 cm². For one patient with insulin treated diabetes mellitus and a heavy exudating neuropathic ulcer of the sole, treatment with NPWT/TNP for two weeks contributed to a reduction of the ulcer size by 33% (Table 1, case 4). However the patient refused continued treatment due to social reasons. For all 12 patients we found the fibrin on the wound bed replaced by granulation tissue after 1-3 weeks. We also found the ulcer edges less oedematous and a strong reduction of exudate, as illustrated by the patient with a pressure ulcer (Table 1, case 2). Before treatment with NPWT/TNP he had to change the dressings three times a day, due to heavy exudate, compared to three times a week during NPWT/TNP. The weekly mean costs of treatment with V.A.C. amounted to €339 and for V1STA to €279 including dressing material. Rental costs for the pumps were the main portion of the total cost, ; for V.A.C. 79% of the total costs and for V1STA 74 % of the total costs. One woman aged 73 (Table 1, case 3) (see figures 1,2,3) with severe rheumatoid arthritis, reduced peripheral circulation and a painful hard-to-heal ulcer was treated with negative pressure as a last option before amputation. Due to a leg ulcer with no signs of healing, unbearable ulcer pain and no chance of surgical reconstruction, the orthopaedic surgeons considered amputation, which she refused. There appeared to be no likelihood of the ulcer healing and to avoid future pain and social distress, which most likely would end in amputation anyway, she wanted to try treatment with negative pressure. Assessment showed ABPI of 0.7 and ulcer size 76.8 cm² measured by digital planimeter. Treatment with negative pressure was initiated after surgical revision of the necrotic tendon. Dressing changes were carried out in primary care three times a week by special trained staff at Blekinge Wound Healing Center. Three weeks’ treatment with NPWT/TNP resulted in the formation of granulation tissue and reduction of oedema. Thereafter we used hydrocolloid dressings and reduced compression therapy for another 13 weeks until the ulcer was completely healed. Figure 1 - Photo showing leg before treatment with negative pressure was initiated. Figure 2 - Three weeks’ treatment with negative pressure resulted in the formation of granulation tissue and reduction of edema. Thereafter we used hydrocolloid dressings and reduced compression therapy for another 13 weeks until the ulcer was completely healed. Figure 3 - There was complete ulcer healing after 16 weeks of treatment with no recurrence at follow up 22 months later. We found that treatment with NPWT/TNP for wound management in primary care in half of the cases led to complete ulcer healing and in all cases accelerated the growth of granulation tissue. Our experience showed that treatment with NPWT/TNP could be used as a manageable method in primary care for treating pressure ulcers, venous or multi-factorial ulcers with signs of delayed healing and postoperative wounds/traumatic ulcers. Mean treatment time with NPWT/TNP in this study was 7.3 weeks (median 3 weeks). As for patients with diabetes mellitus and neuropathic foot ulcers they need a multi-disciplinary approach for treatment, not only of their ulcer but to maintain metabolic status and to avoid the often harmful ulcer infection recognized in neuropathic foot ulcers., For these patients, treatment with NPWT/TNP should thus be introduced in collaboration with the Orthopedic Department or the diabetes foot ulcer team. In earlier studies on NPWT/TNP the researchers have concluded that this technology should be considered ”the treatment of choice” for chronic (hard-to-heal) ulcers due to its significant advantages concerning time for wound healing and ”wound bed preparation” compared with conventional therapy. However, other researchers have reported that NPWT/TNP may improve wound healing but that the body of evidence available is insufficient to clearly prove an additional clinical benefit of this treatment. All patients in our study group had had conventional therapy with a mean of 80 weeks (median 26 weeks) before treatment with NPWT/TNP. Conventional therapy included compression with 2-, 3- or 4- layer bandages depending on the ABPI and IPC when appropriate and the use of dressings such as hydrocolloids, polyurethanes, topical antimicrobials (cadexomer iodine and silver) or larvae therapy and pinch grafting. In the patients studied, treatment with either conventional therapy or with NPWT/TNP did not achieve ulcer size reductions of 20-40% within 2-4 weeks, which is said to be a reliable predictive indicator of healing specifically for venous leg ulcers. . However, NPWT/TNP did initiate formation of granulation tissue, within 1-3 weeks. We consider treatment with negative pressure in primary care, although manageable, to be one of many alternatives for ulcers with delayed healing. We do not agree with earlier researchers  that NPWT/TNP should be ”the treatment of choice” for hard-to-heal ulcers in primary care. Although calculating the costs was not a primary aim, we found it important to note the costs for using NPWT/TNP in primary care. Costs for treatment with NPWT/TNP in one study were found to amount to approximately half the costs for conventional therapy. In our study we found that weekly costs for treatment with NPWT/TNP varied between €279 and €339 (at 2009 price levels) which would be roughly twice as high as was earlier reported for conventional therapy. The author has, as a general practitioner with special interest in leg ulcer care, twenty years’ knowledge of treating patients with hard-to-heal ulcers . In my experience wound management demands well organized teams around the leg ulcer patient, which is in accordance with findings in earlier studies. Using modern treatment with NPWT/TNP in primary care thus requires teams with the skills and abilities to meet the challenges of introducing new techniques to achieve improved treatment outcomes. The problem of antibiotic resistance worldwide and especially in wound management has not been discussed in this study. However, it is thought that further studies on treatment with NPWT/TNP in infected hard-to-heal ulcers should be undertaken. From the author's experience the greatest benefit from using NPWT/TNP for patients with hard-to-heal ulcers or complicated postoperative wounds in primary care, is the formation of granulation tissue, which is a fundamental requirement in ulcer healing. Considering the small study size, the population heterogeneity and the treatment regimens before TNP/NPWT, our experience is that treatment with negative pressure could be used as a manageable alternative for wound management in primary care. 1. Argenta L.C, Morykwas M.J. Vacuum-assisted closure: a new method for wound control and treatment: clinical experience. Ann Plast Surg. 1997; 38(6): 563-76. 2. Philbeck T.E. Jr, Whittington K.T, Millsap M.H. Briones R.B, Wight D.G. Schroeder W.J. The clinical and cost effectiveness of externally applied negative pressure wound therapy in the treatment of wounds in home healthcare Medicare patients. Ostomy Wound Manage 1999; 45(11): 41-50. 3. Gustafsson R. Vacuum-Assisted Closure Therapy - A new Treatment Modality in Poststernotomy Mediastinitis. Department of Cardiothoracic Surgery, Lund University, Lund. 2004. 4. Sj�gren J. Vacuum-assisted closure in cardiac surgery - clinical outcome and vascular effects. Department of Cardiothoracic Surgery, Lund University, Lund. 2005. 5. Mokhtari A. Vacuum-Assisted Closure Therapy after Cardiac Surgery. Sternal Stability, Cost of Care, Learning Curve and Hemodynamic Outcome. Department of Cardiothoracic Surgery, Lund University, Lund. 2008. 6. Swenne C.L. Wound Infection Following Coronary Artery Bypass Graft Surgery: Risk Factors and the Experiences of Patients. Department of Public Health and Caring Sciences, Uppsala University, Uppsala. 2006. 7. Blume P.A, Walters J, Payne W, Ayala J. Comparison of negative pressure wound therapy using vacuum-assisted closure with advanced moist wound therapy in the treatment of diabetic foot ulcers: a multicenter randomized controlled trial. Diabetes Care 2008; 31(4): 631-6. 8. Vuerstaek J.D, Vainas T, Wuite J, Nelemans P, Neumann M.H, Veraart J.C. State-of-the-art treatment of chronic leg ulcers: A randomized controlled trial comparing vacuum-assisted closure (V.A.C.) with modern wound dressings. J Vasc Surg 2006; 44(5): 1029-37. 9. European Wound Management Association (EWMA). Position Document : Topical negative pressure in wound management. 2007. 10. Horn P.L, Ruth B, Kean J.R. Use of wound V.A.C. therapy in pediatric patients with infected spinal wounds: a retrospective review. Orthop Nurs 2007; 26(5): 317-22. 11. Baharestani M, Amjad I, Bookout K, Fleck T, Gabriel A, Kaufman D, et al. V.A.C. Therapy in the management of paediatric wounds: clinical review and experience. Int Wound J 2009; 6 Suppl 1: 1-26. 12. �ien R.F, Ragnarson Tennvall G. Accurate diagnosis and effective treatment of leg ulcers reduce prevalence, care time and costs. J Wound Care 2006; 15: 259-262. 13. �ien R.F. RUT – a winning concept for both patients and the health care sector. EWMA Journal 2009; 9(2): 41-4. 14. Flanagan M. Improving accuracy of wound measurement in clinical practice. Ostomy Wound Manage 2003; 49(10): 28-40. 15. Forssgren A, Fransson I, Nelz�n O. Leg ulcer point prevalence can be decreased by broad-scale intervention: a follow-up cross-sectional study of a defined geographical population. Acta Derm Venereol. 2008; 88(3): 252-6. 16. �ien RF. Leg ulcer management in primary care with special reference to pinch grafting . Department of Community Medicine. Lund University. 2002. 17. European Wound Management Association (EWMA).. Position Document : Management of wound Infection. 2006. 18. Principles of best practice: Wound infection in clinical practice: An international consensus. Int Wound J 2008; 5 Suppl 3: iii-11. 19. Oien RF, H�kansson A, Hansen BU, Bjellerup M. Measuring the size of ulcers by planimetry: a useful method in the clinical setting. J Wound Care 2002; 11(5): 165-8. 20. Eneroth M, Larsson J, Apelqvist J. Deep foot infections in patients with diabetes and foot ulcer: an entity with different characteristics, treatments, and prognosis. J Diabetes Complications 1999; 13(5-6): 254-63. 21. Lipsky B. A report from the international consensus on diagnosing and treating the infected diabetic foot. Diabetes Metab Res Rev 2004; 20(Suppl 1): 68-77. 22. Ubbink DT, Westerbos SJ, Evans D, Land L, Vermeulen H. Topical negative pressure for treating chronic wounds. Cochrane Database Syst Rev 2008; (3): CD001898. 23. Gregor S, Maegele M, Sauerland S, Krahn JF, Peinemann F, Lange S. Negative pressure wound therapy: a vacuum of evidence? Arch Surg 2008; 143(2): 189-96. 24. Ragnarson Tennvall G, Hjelmgren G, �ien R. The cost of treating hard-to-heal venous leg ulcers: results from a Swedish survey. World Wide Wounds 2006; available from URL: http://www.worldwidewounds.com/2006/november/Tennvall/Cost-of-treating-hard-to-heal-venous-leg-ulcers.html. 25. Dorman M.C, Moffatt C.J, Franks P.J. A model for change in delivering community leg ulcer care. Ostomy Wound Manage 1995; 41(9): 34-42. 26. �ien R.F, H�kansson A, Ovhed I, Hansen B.U. Wound management for 287 patients with chronic leg ulcers demands 12 full-time nurses. Leg ulcer epidemiology and care in a well-defined population in Southern Sweden. Scand J Prim Health Care 2000; 18: 220-5. 27. Grol R, Grimshaw J. From best evidence to best practice: effective implementation of change in patients' care. Lancet 2003; 362(9391): 1225-30. 28. Andr� M, Eriksson M, Odenholt I. Treatment of patients with skin and soft tissue infections. Results from the STRAMA survey of diagnoses and prescriptions among general practitioners. L�kartidningen 2006; 103(42): 3165-7.